On Monday 28 September, Berik Zhakiparov from Zhezkazgan was joined by socialists and trade unionists outside the London offices of KazMinerals plc. The company dominates his home city in Kazakhstan. It exploits tens of thousands of workers in its copper mines, processing mills and smelting works. As I have seen for myself, it pollutes the air and the rivers of the city and of the surrounding countryside. Over the years, the company has extracted huge profits – up to €200 billion in 10 years, salted away abroad. Yet it refuses to invest in new machinery or safety equipment to ease the burden of its workers and eliminate the horrific rate of deaths and injuries at its plants. The company refuses to pay decent wages or to allow genuine trade unions to be formed. When worker activists speak up they are victimised – harassed or sacked. Before picketing the London headquarters of KazMinerals in Victoria Street, London, I wrote to the company on behalf of supporters of Campaign Kazakhstan and the National Shop Stewards’ Network to explain why Berik was in London. I telephoned their office on a number of occasions, asking to speak to the Chairman of the company – Vladimir Kim or one of the several English members of the Board. Berik was particularly keen to meet not only Mr Kim but also the head of the Health and Safety committee of the company (who has never visited the actual workplaces!). Berik wanted to put across to both of them how workers feel about the life-threatening working conditions in the company’s plants. The reply from the company’s receptionist was always that there was no one in the office that we could speak to. Later we received a letter from the Company Secretary of KazMinerals saying his company was now separate from Kazakhmys, which is based in Karaganda, and that it had perfectly good relations with its workers! When we eventually found the sumptuous offices of Kazminerals in Cardinal Place, some very large private security guards were waiting for us. There were also some casual observers sitting or walking around – obviously from the Kazakhstan embassy and taking a lot of photos! One of the office guards reluctantly agreed to convey our request for a company representative to come and meet us. Berig had a petition with him that had been signed by more than 300 trade unionists and activists during the week he had been in Britain which he wanted to hand over personally. When the security man returned, he said no one could meet us and would not give any name of who had told him this! We took all of this to indicate a guilty conscience and a direct link between KazMinerals and Kazakhmys! The demonstrators on Monday held up placards demanding better wages and conditions, an end to deaths in the work-place, the reinstatement of sacked workers’ leader, Erlan Tabinov, and hands off Maksat Esenbayeva and all worker activists. These demands can be supported by using the petition sheet on this site here. Having been in power since 1989, Nursultan Nazarbayev, President of Kazakhstan proposed in the spring to bring the 2016 presidential election forward. Needless to say, the puppet parliament approved the proposal and announced an election will be held on April 26th. Last week the list of 3 candidates eligible to stand in the election was announced and the official campaign started. However, the election is no more than a plebiscite intended simply to prolong the presidential term of Nazarbayev. The decision to call an early election was not taken lightly by the Akord (Presidential administration) but was motivated by concern about the deepening of the economic crisis and further fall of the oil price as well as by the increasing enfeeblement and poor health of the president himself. The Bonapartist (authoritarian) regime is at the peak of its development, with all the power, capital and property concentrated into the hands of the president and his close entourage. All, even potentially dangerous figures and groups around whom opposition could emerge, have been neutralised, broken up or liquidated. It appears as if the ruling elite is consolidated as never before. But those close to Nazarbayev, his relatives and henchmen are worried about what state he will be in in a year, whether he will be able to conduct a campaign, if there is a growth of discontent and widening social protests in the country. For this reason, the presidential plebiscite has been brought forward, when there is the lowest possible political activity in the country and whilst it is still possible to hold the tenge (currency) artificially high, before devaluation takes place. The elite hope their actions will keep the presidential throne within the family and form a dynastic system for the transfer of power in the country. If there is the death or long term hospitalisation of Nazarbayev after the election, there will then be no need for a new election as, according to the constitution, either the speaker of the senate, the speaker of the mazhilas (parliament) or the prime minister takes over as acting President. By serving out the rest of the term, they then gain several years in which to prepare for their own election. Preparations for this early election have been going on for some time. At the end of last year, Nur Otan (ruling party) presented its new programme “Nurli Zhol” (Path to the future) at the same time as Nazarbayev’s daughter Dariga was promoted to head Nur Otan and to the position of deputy speaker. The political arena was purged with the suspicious death in custody in Austria of the oligarch oppositionist (and Dariga’s ex-husband) Rakhat Aliev, the extradition from France to Russia of the other oligarch oppositionist , Mukhtar Ablyazov, and the banning of the activities of the country’s tame “Communist” party. The entourage is rushing, afraid that they have little time left before the re-emergence of protests and the workers movement whilst the president is still around, so they can re-arrange their forces and ensure stability if he has to leave. Whether their plans will succeed is under much doubt. This pseudo-election, even when compared to all other elections in the country which have never been honest, transparent or genuinely competitive, is the first in which the president’s office has not even bothered to pretend there are alternative candidates. The leader of the “United Social Democrats”, Zharmakhan Tuyakbai, and of the pro-Nazarbayev “Ak zhol” party, Azat Peruashev, and even the “ecologist”, Mels Eleusizov, have all refused to run. The first two are maybe waiting for next year’s parliamentary election, and are concerned that a low vote this time will discredit them. In this situation, when political activity is very low, with the complete collapse of the liberal bourgeois opposition and the banning of the old ‘Communist’ party, the presidential administration has had to put up sparring partners from within its own ranks. The first of these is Abelgazi Kusainov, the former akim (mayor) of Karaganda and now head of the “Trade Union Federation of Kazakhstan” – a grey candidate, a complete product of the bureaucratic system who was appointed to head the state supported trade union as part of the president’s 2013 reforms of workers’ rights in his “Society of Universal Labour”. The aim of this reform was to strengthen the undemocratic state-sponsored union to prevent a repeat of the 2011 oil-workers’ protests. It was accompanied by the introduction into the criminal law of the country of the criminalisation of independent trade union activities. 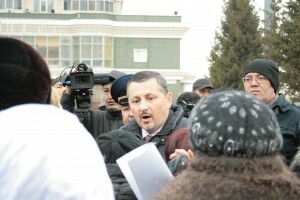 As akim of Karaganda, Kusainov did all in his power to prevent strikes and protests by the workers, he continued this activity against the workers of Zhezkazgan. Workers also experienced his actions when, in 2003 as minister for trade and industry, he helped to liquidate and asset strip the Irtyshskii copper foundry. As a bureaucrat and member of the Nur Otan ruling party, he heads the trade union as a representative of the mining companies and oligarchs to prevent the development of a genuine workers’ movement. His nomination is useful too, as it enables the regime to present an image of alternative elections to the west – “look we even have a trade unionist and a communist standing”. The “communist”, according to the head of the communist faction in the parliament moving his nomination, is a “real Leninist”. But Turgin Syzdykov, head of the puppet “Communist Peoples’ Party of Kazakhstan” is an even greyer and less known candidate than Kasainov. His party’s approach to the “Society of Universal Labour” stresses their support and only complains that it doesn’t implemented things properly. His candidature is proposed only, it seems, to give the impression that there is a “left” candidate. Most importantly, both “alternative” candidates call for support for Nazarbayev in the election! 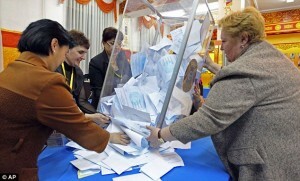 Even Kazakhstan has not seen such a farcical circus of an election before. The struggle under the covers continues. Even though on the surface it appears that the ruling class has reached agreement for the election, the permanent war between the different groups is continuing behind the scenes. After the election, it could blow up again. Talk here is not about a complete split in the ruling class, but a confrontation between the different wings of the ruling family. Two wings have their eye on the throne – elder daughter Dalgira, deputy speaker and head of Nur Otan on the one side and Nazarbayev’s “middle” son-in law, Timur Kulibayev, and his ally the Prime Minister, Karim Massimov, on the other. All other figures and palace oligarchs circle around these two main forces, the battle for the throne will be determined by who supports whom and this makes the question of whether the ruling elite will be able to maintain stability after the handover very debatable. An open struggle could lead to the activisation of the various regional groups, who up to now have been weakened by the purges and repression. It’s not accidental that at a recent outburst by football fans in Aktobe, provoked by the regional clan elite, the demand for the separation of the territory of the region from the rest of Kazakhstan was raised. Of course, a key factor in developments which cannot be ignored is the development of a politicised workers’ movement and social protests. This includes in particular the rural unemployed youth and internal migrants who are already capable of gathering in thousands at a moment’s notice. In the situation when the living standards of the masses falls, when production is dropping, unemployment increasing and the government is pushing through a programme of budget cuts and privatisation of the health and education systems, a protest movement could take on a national character, especially in the event of the death or long hospitalisation of Nazarbayev. Protests in Uzbekistan or Kyrghizia could also influence events. In preparation for such developments the police and internal troops are being strengthened, weapons are being purchased in Europe. The new criminal code is being implemented in which there are seven specific points against the independent workers’ movement. At the same time, the ultra-right nationalists are being built up, who, supported by the authorities and political police, are filling the social networks with a multitude of publications and resources with the aim of splitting ordinary people from each other, of diverting the Kazakh speaking youth away from active protests. So there is no point in expecting these early elections to lead to any miracle of eternal stability and regime conservation or panacea from social shocks and instability at the top. On the contrary, they are no more than a convulsive attempt to maintain power at any cost in an attempt while there is still a chance to form a dynastic system. Clearly any participation in this circus spectacle is meaningless. It is clear that it is necessary to call for a boycott of this election, for people not to vote and to use the opportunity for maximum propaganda against all the candidates. Nevertheless, this plebiscite demonstrates again the political vacuum in the country, the complete lack of any opposition organisations and candidates, who can represent the interests of workers and the wider layer in society. We can already see important developments with several different processes merging: the oil-workers are regaining their confidence with the release of their last prisoners, the beginning of some as yet localised strikes, the mass resignation from the state supported trade union, a general politicisation with the ignoring of the election and instead the raising of calls for the setting up of political workers’ organisations in the country. These important developments and changes in political consciousness underline that it is not enough just to call for a boycott, but to argue for the need for the self-organisation into class-based independent trade unions and to begin the discussion about establishing a workers’ party based on a socialist programme. By posing the question in this way, we are reflecting the attempts by workers to unify their forces, to defend their rights and interests, to the need not just to defend their interests but to organise new large scale strikes and protests and the fact that the mass of oil-workers as well as many other workers across the country see how farcical these elections are. Today, activists of the ONJ – the organisation known as ‘Leave the People’s Homes Alone’ – from various regions of the country, have been trying to get a meeting with the candidate for the post of president, namely Nazarbayev. All entrances to the President’s office and the House of Ministers were blocked by police. As on 19 March this year, ONJ members communicated through a presidential aide, N Onjanov, that they wanted to meet the person who is standing for the highest state position. But Nazarbayev, according to this civil servant, was very busy and was today visiting the area of Semey. The Attorney of Yesil district received a clear declaration from the activists that mortgage-holders were seeking a peaceful meeting and the authorities had nothing to fear. In response, the Attorney issued a warning to them. With this, the exchange of courtesies almost came to an end, apart from both sides photographing and filming each other. To the questions of when would ordinary mortgage-holders like teachers, nurses and other workers, who make up the majority of borrowers hit by the financial crash, be in a position to pay their loans from their wages, there was no concrete answer from the official. Then he thanked each ONJ activist by name and in every sentence repeated that without their struggle and their participation in the working group, there would not have been any help along the way and invited them all to go with him to a hall for further clarification about the programme for refinancing mortgage loans yet to be adopted. Apparently he was frozen, being from Almaty and unaccustomed to the cold. Saying he would give up his return ticket, bought with public money, the official promised to remain in Astana to explain further the measures taken that have actually profited the banks (although no one had asked him to!). Today, there was no provocation from the special branch. And the loans demonstrators gave them no cause for making arrests. Thanks are due to all in Astana who have expressed their support and given food and shelter to the demonstrators. Tomorrow is another day of protest. Same place from morning to evening. It remains to be seen if the president makes any response. Re: Bar Council Business Development Mission to Kazakhstan. The Haldane Society of Socialist Lawyers was founded in 1930. It is an organisation that provides a forum for the discussion and analysis of law and the legal system both nationally and internationally, from a socialist perspective. It is independent of any political party. Its membership consists of individuals who are lawyers, academics or students and legal workers, and it also has trade union and labour affiliates. We write to express our profound concern about the ‘business development mission’ you are organizing to Kazakhstan for 26-30 April 2015. Based on Kazakhstan’s human rights record, lack of an independent judiciary or any respect for procedural due process, such a mission appears ill-judged, to put it at its lowest. The Bar Council represents the bar community of England and Wales. As such, we believe the only appropriate stance for our Bar Council is to conduct a thorough investigation into violations of international human rights norms in that country. Kazakhstan has an appalling human rights record, as is acknowledged by the United States State Department, Human Rights Watch, Amnesty International and all international human rights monitors. Reporters Without Borders reports the state has control over independent media, NGOs, civil society, and effectively crushes dissent. The vast majority of the population lives in poverty and those who speak out against the state or organise mass resistance are harassed, jailed, or killed. In mid-2011, oil workers took industrial action – demanding better pay, better working conditions, and the right to organize. Industrial action was met with a vicious state attack and massacre. 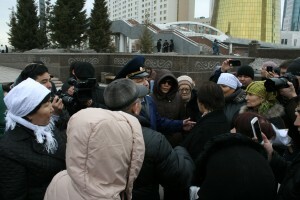 On 16 December 2011, the state launched an unprovoked attack on a peaceful gathering in the central square of Zhenazoen. The BBC reported that 11 were killed, but workers in the area estimate that up to 70 strikers and supporters were actually killed. Numerous arrests were later made and trumped up charges were filed against workers. This view is shared by Human Rights Watch in their World Report 2015. Human rights defenders face constant persecution and harassment by the government in the course of their work. Vadim Kuramshin a well-known lawyer and human rights defender has worked for many years to expose the ill-treatment of prisoners in Kazakhstan. In December 2012, Vadim was sent to prison for 12 years on trumped-up charges on which he had first been acquitted. The trial has been condemned for breaching Kazhakstan’s own court procedures. This outrageous verdict was upheld by the Court of Taraz on 14 February 2013. Yet on 5th December 2013 he was awarded the prestigious 18th annual Ludovic-Trarieux Human Rights Prize for lawyers working in defense of human rights. We continue to protest his innocence. We consider the proposed ‘business development mission’ a serious misjudgment by the Bar Council. Given the level of human rights abuses carried out by the state in Kazakhstan we ask that you cancel this mission as it gives tacit support in legitimising the Nazabayev regime. Further we call on the Bar Council to organize a mission to investigate human rights abuses in Kazakhstan. On 19 March, a court in Aktau decided to parole the last two remaining imprisoned oil workers from Zhanaozen. Naryn Zharylgasynov and Kanat Zhusipbaev were convicted for involvement in a nearly eight-month strike of workers in 2011. It appears that the paroles are linked to early presidential elections and the authorities wanting to give the appearance of the regime relaxing its authoritarian grip. The freed workers expressed special thanks to the Mangistau regional Aktau trade union leaders who were constantly in touch with them and to Paul Murphy, a former Member of the European Parliament for the Socialist Party of Ireland (CWI) who is now a member of the Irish parliament . He visited Zhanaozen and also moved three resolutions on the massacre and injustices there at the European parliament as well as speaking at numerous conferences and events in support of the convicted workers. Within two weeks, both workers were due to meet their comrades and fellow workers, as well as Aktau trade union leaders. It will mark a day when forces can begin to be gathered to start a new phase of struggle. It is clear that this is not the end of the oil workers’ struggle. The fight for the full rehabilitation of the convicted members of the heroic oil workers’ strike must go on, calling for nationalisation of the mining industry under workers’ control, for trade union freedom and the creation of a trade union-based workers’ party. The demonisation of oil workers by the regime must stop! They are fighters for the cause of the working class in Kazakhstan! The fight must go on to get an independent investigation into the mass shooting, torture and disappearance of strikers and local people on 16 December 2011. Kazakhstan came into the year 2015 carrying a heavy load of social, economic and political problems. A worsening of the situation had been seen in the year before, but the social and economic problems which affect the everyday lives of ordinary people have got more difficult to bear. Kazakhstan’s economy is based on raw materials, especially oil, but its production methods are not competitive and the price of oil is falling on the world market. The problems in the economy are reflected in a worsening of the country’s internal social policies. The population have had to suffer rocketing, uncontrolled price rises, big increases in the cost of utilities, cuts in jobs and pay and, as a result, a steep fall in general living standards. Those hit hardest are the workers employed in the different spheres of production who make up the majority of the working population. In the last few months there has been a series of spontaneous strikes, particularly of workers in the Mangistau and Aktyubinsk areas representing the oil extraction industry. The situation in the Zhezkazgan region has got significantly worse. The main employer there is the corporation, Kazakhmys, which extracts copper ore. The local people are very worried about the deteriorating situation, which includes cuts and lay-offs. The corporation is unwilling to bear the burden of paying for any of the social services in the region, with the result that the government has been forced to pay out subsidies from the national budget. It is a paradoxical situation where the corporation rakes in handsome profits and the cost of social needs is covered by the state. This is the way Kazakhmys operates. It is anyway a business enterprise run by and for government officials. The recent ‘Law on trade unions’ adopted in Kazakhstan has severely limited the right of workers to organise themselves and, as a result, to defend themselves from both bosses and officials. Nevertheless, paradoxically, this law has pushed workers more in the direction of protest action. It is no secret to anyone that relations between workers and bosses are not established in the realms of law but in the context of the pressure from above and the superior position of the bosses. State bodies in no way regulate these relations and always stand on the side of the capitalists. All this looks more like the Middle Ages. In today’s world the number of poor and jobless is constantly increasing. However the powerful in society prefer to ignore this, continuing to praise the policies of Nazarbayev. In fact, there is not one aspect of people’s lives unaffected by crisis. The problems of people who have outstanding loans with the secondary banks have got worse – whether it is house-holders with mortgages or people who borrowed to develop a business or simply to cover everyday personal requirements. Most borrowers have ended up unable to repay their loans. It recently came out that people’s savings which had accumulated in a pension fund, were just appropriated by the government and put into subsidising the agricultural sector, without anyone being consulted. This is a scandal but it also underlines the precarious situation within the economy. Against this background of big economic problems in Kazakhstan, an early election for president has been announced for April 26 this year. It is worth pointing out that, throughout the period since independence, not one presidential election has been held at the full term! Every presidential campaign has been premature. This most likely happens because of the lack of confidence in the future for people and, therefore, the government itself. People in Kazakhstan are generally apathetic towards the up-coming election and not interested in it because they are accustomed to knowing the result in advance, because of the administrative resources put into extending the mandate of the incumbent president. Most of Kazakhstan’s population are very disturbed by the events in Ukraine and, imagining such a situation in Kazakhstan, are settling for a result known in advance, linking a peaceful life in the country with Nazarbayev’s actions. Of course, this is the fruit of the work done by the regime’s kept spin-doctors. The signing of a Customs Union between Russia, Kazakhstan and Belorussia and, after that, the Eurasian Economic Union, did not bring the hoped for results and look more like declaratory agreements between dictatorial regimes with the aim of maintaining their own personal power and security. In today’s Kazakhstan, all opposition parties have been prevented from operating by the present regime. Political opponents have either been discredited or forced to leave the country under threat of arrest on trumped-up charges. The present situation in Kazakhstan is very difficult, whatever rosy picture is drawn by the government and the parliament – mere puppets who never take independent decisions. The only force capable of standing up to the existing government and trying to change the situation for the better is the workers’ movement in the form of the trade unions – who have also suffered repression – and social organisations of people who fight for social justice. For real change, we need to try and build a party of opposition that fights for real democracy and workers’ rights, and for industry to be owned and run democratically by the working class.